So You Dropped Your Blackberry/Cell Phone In The Water? About 3-4 months ago I put my Blackberry Curve in a little bit of water at the Interlude here in Charlottetown. The phone was out of warranty by a week and I ended up going out and purchasing another Blackberry Curve. Present day, I was using my old cell phone as a charger for the second battery since it was working fine and didn't appear to get wet. This helps as I do need two batteries on some days. After a while, my old Blackberry came back to life. I read around and most people's did end up coming back but only for a short period in time. This was the same case with mine. It stopped working shortly after it magically worked again. 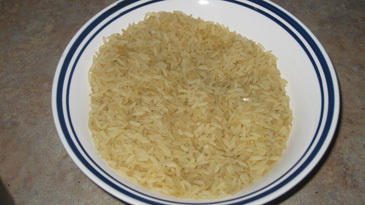 Then I was reading online a couple weeks ago how rice will really absorb moisture. I had a 2kg bag of Uncle Ben's rice up on the shelve and figured, why not give it ago! So 2 days ago I filled up a dish with rice and put my old Blackberry in it (of course I removed the battery too). Today I took my old waterlogged Blackberry out of the rice and voila, it works again. As for if it will stop working, I hope not as I'd like to play around with it a bit more. I'll keep you updated..